[Brief introduction] This is my first pen review in English. Please overlook my not so good English and crude style. Pilot launched Special Limited Edition named "Hiten" (pronounced "he ten") in Japanese (To be precise, Hiten is abbreviation of Hisho Tennin. Hisho means "in flight", and Tennin means "celestial beings") in 2003 to commemorate the 85th Anniversary of its Foundation(1918). Only 1000 pieces were produced by handmade worldwide truly one-of-a-kind. I was interested in fountain pens about only 2 years ago (and I am still a beginner). So I did not know the existence of them. When I became aware of them and wanted one more than anything else in the world, they have been already sold out anywhere in Japan. I just happened to find this pen auctioned at eBay this February from USA seller. Fortunately I am the only bidder and at last I have got the pen at a bargain price. Perhaps this pen is not famous outside Japan. So I have decided to try telling you details of this pen. 1 First Impressions (9/10) –To my joy, the box that the pen was in is compact, different from many other examples of limited edition pens. My family is not always generous to my enthusiasm for fountain pens. Besides the room for these boxes is limited in my apartment. The smaller, the better in my case. The box was made of wood and the feel of the material did not seem so luxury, but was solid and the elaborate image of Yakushiji-Temple* on the outside is carved on the lid of the box by laser. 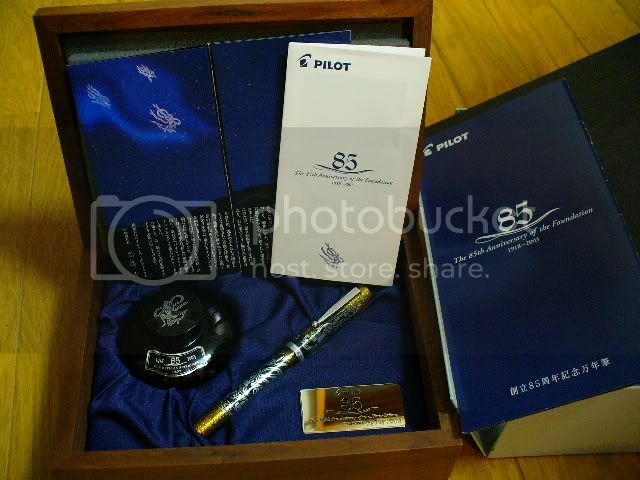 When I opened the box, there were the pen, a special bottle of Pilot black ink with the figure of "Hiten" imprinted on the cap and special label sticked, booklet and the 85th commemorative metal plate on which the serial number was engraved ,against the background of refined dark blue cloth. But polishing cloth that I had been heard to be attached was not contained. Frankly speaking, I was not so surprised at first glance. Because the scene of the pen, plate, bottle etc, had been already branded on my memory through several HP that had presented the pen. But when I took the pen in hand, I was excited gradually to get the pen really at length. And the beauty of the pen so overwhelmed me that I fixed my eyes on the pen for a while. Now I have already had about 20 fountain pens but this pen has been the favorite and the best pen since then. * Yakushiji-Temple was completed around 688 A.D. by Emperor Tenmu to dedicate to the Healing Budda (Yakushi-Nyorai in Japanese,Yakushi means the Physician of Souls,Nyorai means Tathagata ) in the hope that the Empress(his wife, later to become Jitoh ,ruler of Japan) would recover from illness. In 710 the capital was moved from Asuka-Fujiwara to Heijo(today Nara city a little under 50km south of Kyoto City), and in 718 Yakushiji-Temple was also moved to Heijo. In 730 the East Pagoda (National Treasure) of Yakushiji-Temple was built and is the only surviving building from the original Yakushi-ji Temple complex. The pen design is based on "Suien" installed atop of the Pagoda that is praised for its beauty as "Frozen Music". "Suien" that means "Water Flame" cloud of mist is an ornament made in the shape of flame to be a charm keeping fire away. It is composed by 4 bronze fretwork panels that intersect at right angles. In each panel 3 celestial beings(the upper,middle and lower) with their robes made of feathers to descend from the heaven to the Healing Budda in the main hall of the Yakushi-ji Temple swooping down gracefully amid the fleeting clouds of flames are carved in open work. The upper figure holds in both hands a lotus bud as an offering. The middle figure holds a flower tray scattering flowers. The lower figure is on bended knee playing a flute. People of ancient times imagined celestial beings were scattering flowers, playing music under the bright shining stars of night. 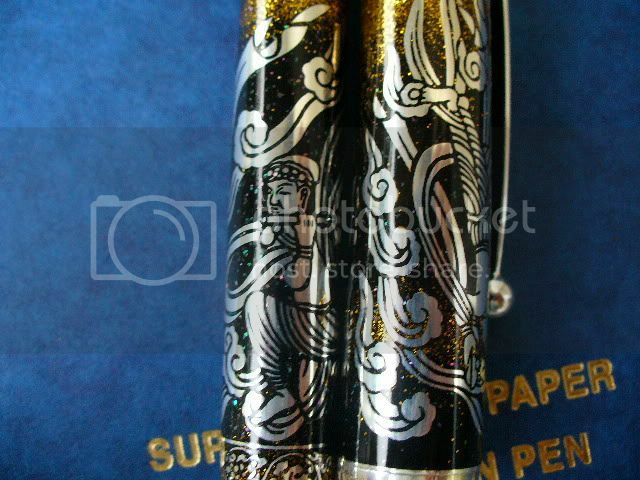 2 Appearance & Design (10/10) - The motif of the pen is above-mentioned 3 celestial beings in flight on "Suien". Why? I do not know the reason. Of course Pilot ought not to back up specific religion. But it is said that the Yakushi-Nyorai(Tathagata)( Healing Budda )will give aid to people that are suffering from distress of illness and so on. The ancient people without enough medical treatment asked the Budda for healing literally. Since 1961 Japan has had health insurance system to cover the Japanese people universally and WHO has appreciated the medical system of Japan as the best in the world. But in fact the Japanese people have some dissatisfaction and Pilot must think that the people of the present age are also asking someone for healing and the theme of healing is suitable for the 85th anniversary pen. Of course this is just my guess. 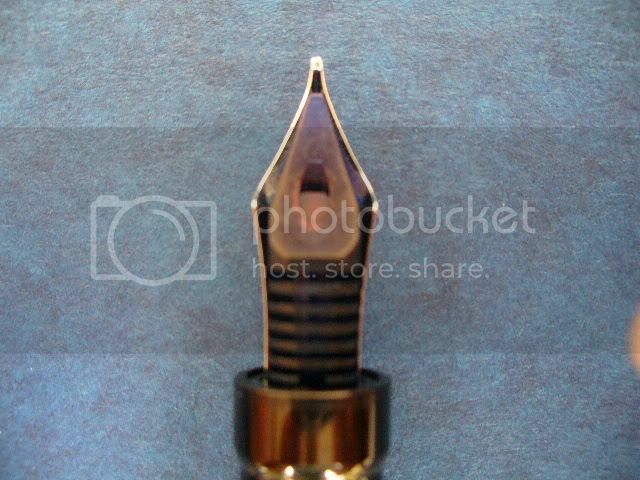 The shape of the pen is so-called vest type, the top and the bottom is both flat and the shape is cylindrical, resembles that of the Pilot 70th Anniversary pen (that I may try reviewing if you wish). Perhaps that shape is symbolically important for Pilot because it is the shape of the first pen ,all of which is produced by Pilot's own efforts in its history. 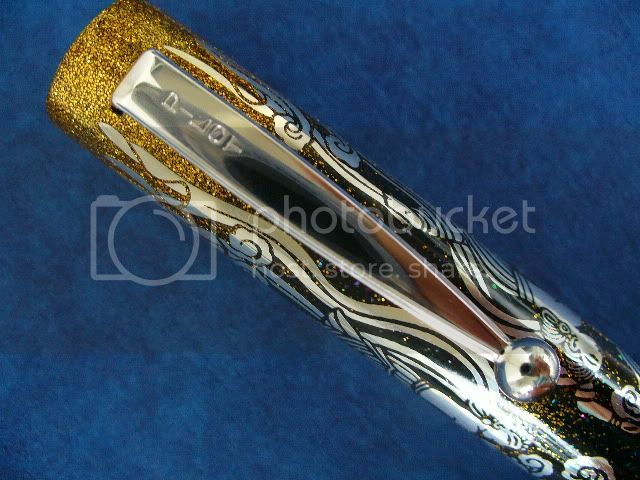 The pen is made of primarily sterling silver with the Hyomon-style, Togidashi Maki-e, utilizing abalone shells and gold. The grip section is made of resin. On the part of the barrel just under the clip (when the cap is tightened fully, the same part comes surely under the clip owing to precise process )that will attract attention the most, the lower celestial being on bended knee playing a flute is depicted in silver. Beneath the being is cascading vine foliage (arabesque) in silver that is reminiscent of the Tathagata pedestal in the main hall of the Yakushi-ji Temple. Regarding the arabesque patterns, there are 2 different kind of patterns, and in each pattern, 3figures are depicted. So there are 6 figures around the barrel. 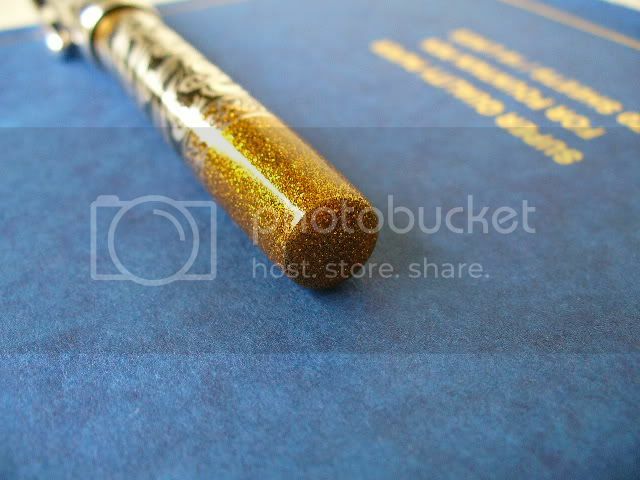 Both of the bottom and the part near the cap end of the barrel is almost covered with gold foil. 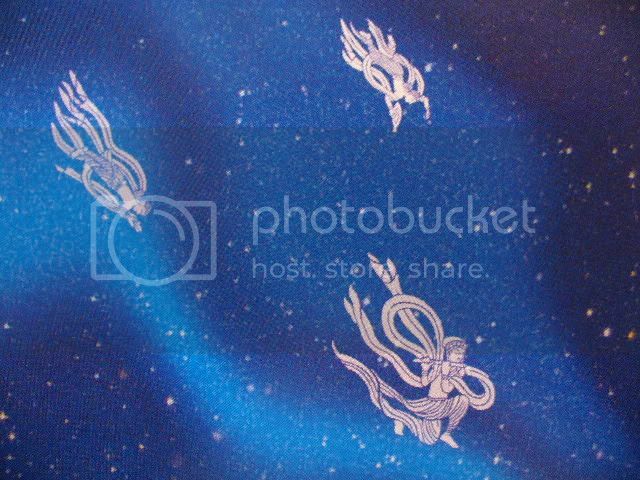 On the cap the upper and the middle celestial beings are depicted in silver. 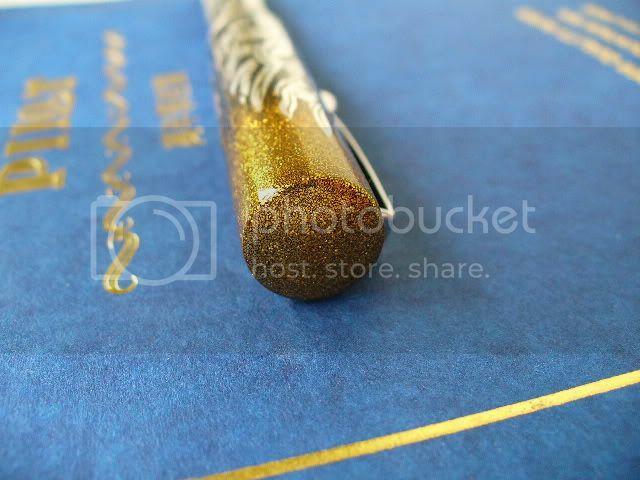 The top of the cap is also almost covered with gold foil. The color of the clip is silver. 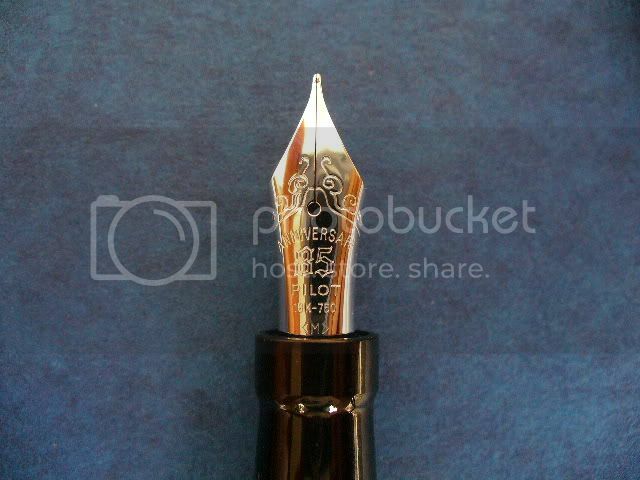 The shape of the clip is also similar to that of the Pilot 70th Anniversary pen. According to the booklet of the 70th, it is made in the shape of Japanese sword and jewel from ancient times. "STERLING SILVER" and serial number "1 to 1000/1000"are carved on the silver of the cap end. 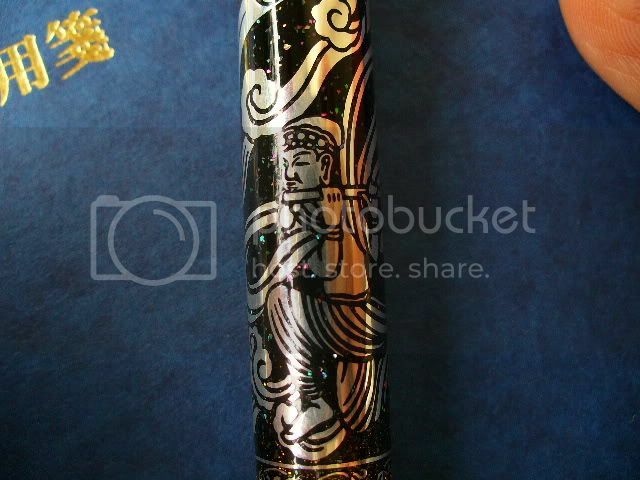 The back ground of the silver celestial beings and fleeting clouds of flames is black Urushi with abalone shells to represent countless glittering stars in the night sky. You will notice that this pen is designed with pristine attention to detail whenever you stare the pen. The trouble is that I am gazing at the pen in spite of myself quite frequently while I am at work using this pen. 3 Weight & Dimensions (10/10) – The length of this pen is almost the same as that of Montblanc 146, measuring 135mm long capped, 125mm uncapped and 160mm posted. The diameter of the cap is 14.3mm long and that of the barrel is 11.8mm. I think many people feel that it fits their hands. It weighs 37g, and I feel comfortable, not too heavy nor too light. 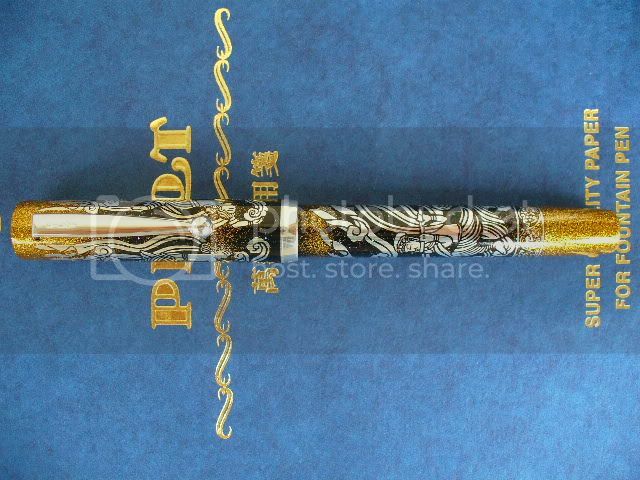 Some pens of this kind, made of silver or Urushi are intended for only appreciation, but this pen is without doubt practical. 4 Nib & Performance (10/10) – This pen comes with a 18kt rhodium plated monotone M nib (As other sizes only B nibs were available.). The size of the nib is No.10 of Pilot that are attached to Custom 742, Bamboo, Custom Maple and so on. The feeder is semitranslucent. 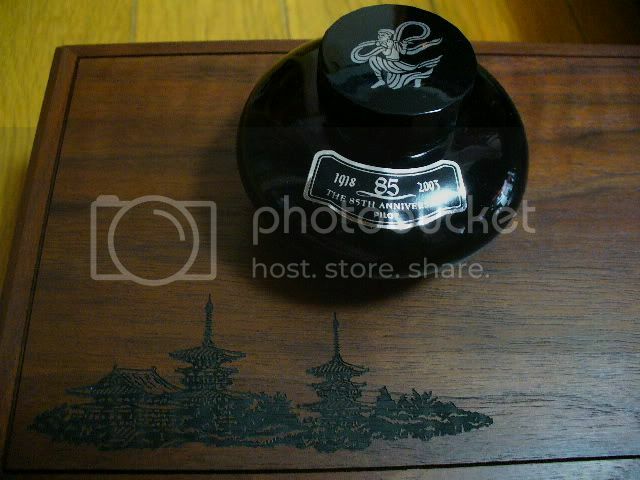 The nib design was specially made, imprinting "ANNIVERSARY 85". 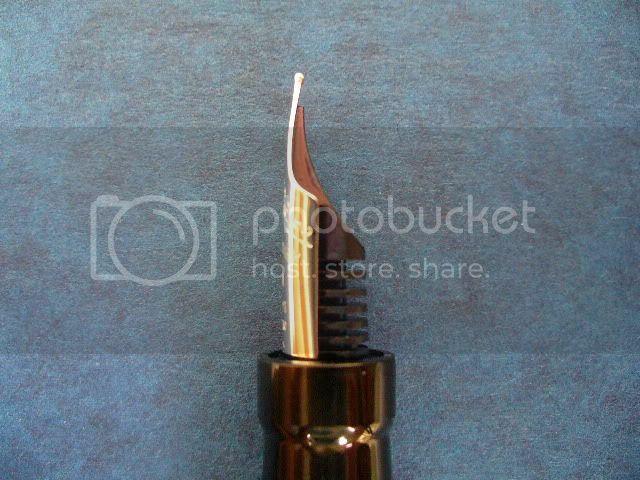 And the nib is bended under unusually. But highly important thing is how it writes. The taste of it is quite different from ordinary Pilot No. 10 nib M. Of course very smooth, besides very flexible, but taking a firm stand. The line it puts down is only a bit finer than that of my Pelikan M750 M. I t was a bit broader than my expectation. But using it with Pilot Iroshizuku Asagao, it becomes clear that the width of the line is practical enough and enjoyable. It is moderate or just a bit wet. So it will be the best pen when we write our diary at the end of the day feeling unhurried. 5 Filling System (9/10) – It comes with a Pilot Con-70 converter that is a Push Button type and holds most ink among Pilot converters (otherCon-20,Con-50). It is very easy to fill it up with ink. By the way, Custom 845, 748, and 90th Anniversary Raden Toki all come with a Con-70 converter. 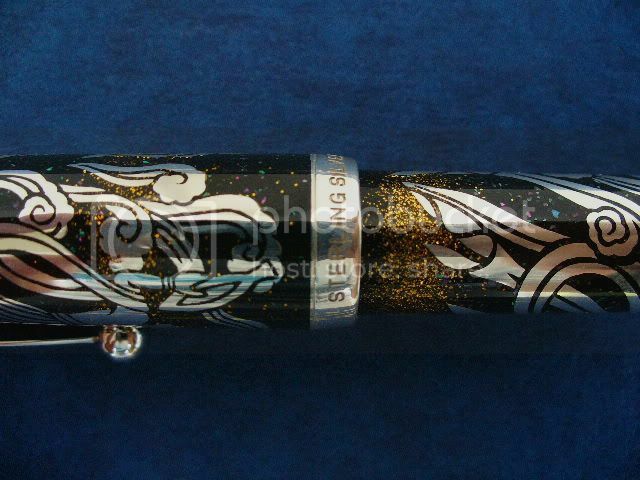 They are usually the black type Con-70, for high end pens.They are made of black resin, not urushi. They are not available independently in general, only attached to the high end pens. But in USA they had been sold. Regarding the 85th, not to be lack unity of silver base, ordinary con-70 were attached. 6 Cost & Value (10/10) - The list price was 120,000 yen (+6,000yen, consumption tax) in Japan, about $1,200 at current rate. Of course this price is not cheap, but has been regarded as fairly bargain price. This silver base with Urushi combination is very rare and cannot be completed without skilled artisans' lots of time and energy. In fact Pilot was said to have no intension to gain profit to thank the customers. It is matter of course that there was a rush of orders for the pen. I happened to buy this pen (NOS) from USA seller under the list price. In Japan even used 85th pen is rarely put on the market. The contract price at that case is usually higher than its list price. So I think I got an incredible good deal .I have already had more than 20 fountain pens (that is small number as a fountain lover?) There are 3 pens that are more expensive at a market price than this pen among my pens. But so far this pen is the best value for me. 7 Conclusion (Final score: 9.7)-Pilot has produced various pens. But I think this pen answers the purpose of both utility and decoration the most ,being within our reach, not too expensive to get. 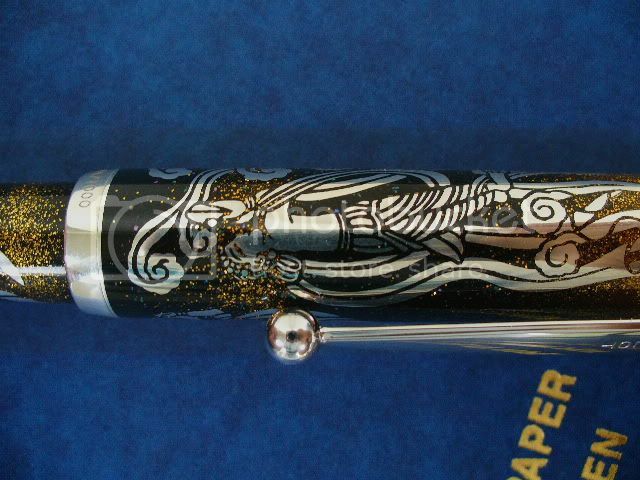 In 2008 Pilot has launched 90th Anniversary Pen Raden Toki (Brass base with Togidashi-Makie and Raden, Cap ring made of sterling silver). Only 900 pieces were produced (smaller than the 85th by 100).The list price is the same as the 85th. Both pens have basically similar character. But I believe the 85th is rarer and more valuable than the 90th.If you find the 85th at a reasonable price, you should obtain the pen with a little strain. Edited by MYU, 16 January 2010 - 04:44.
welcome to FPN and thanks for the very detailed review. The pen is beautiful and very practical as well. I saw from your writing sample that you have the Sailor Realo which i have as well and is one of my favorite pens. Yes, this review was outstanding and it was great to see the pen! Thanks! "In this world... you must be oh, so smart, or oh, so pleasant. Well for years I was smart. I recommend pleasant." Welcome to FPN and many thanks for the nice review and great photos! Keep the reviews coming for more maki-e pens!!! "Move as swift as a wind, stay as silent as the forest, attack as fierce as fire, unwavered like a mountain." I very much enjoyed your detailed review, with all its beautiful photos. Thank you very much for your most welcome contribution. Edited by troglokev, 30 June 2009 - 08:54. A great review and congratulations on a wonderful pen! Thank you.I will try reviewing the Pilot 70th Anniversary next.After next Sailor Realo.Please read the reviews when I post them. Thank you all . I have been encouraged by your kind words. Sorry. I do not have other maki-e pen. 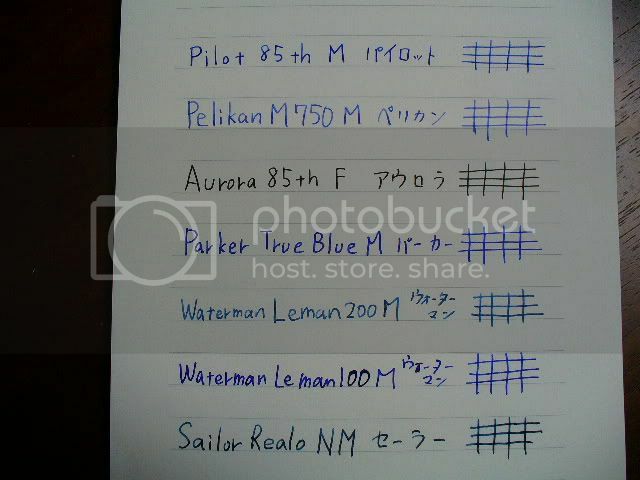 I want to have Pilot Yukari Collection Yozakura Raden and Night line now. But I have only a light purse. I am sure this pen is awesome. But, the drawings on the barrels remind me of the tattoos worn by the Yakuza. I know this is a matter of personal taste. I see. Your view of things is very interesting and suggestive. 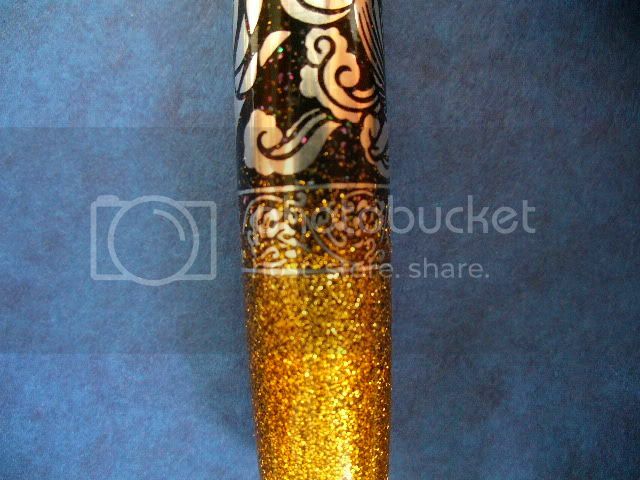 In fact I hear some people say that the gold of this pen looks gaudy.My wife says that the gold and black combination is too flassy and can not accept that I spent so much money for this pen. But I have appreciated the decision of Pilot,conservative company,to make this controversial pen. Edited by rokurinpapa, 01 July 2009 - 07:55. Thank you for this contribution, rokurinpapa. 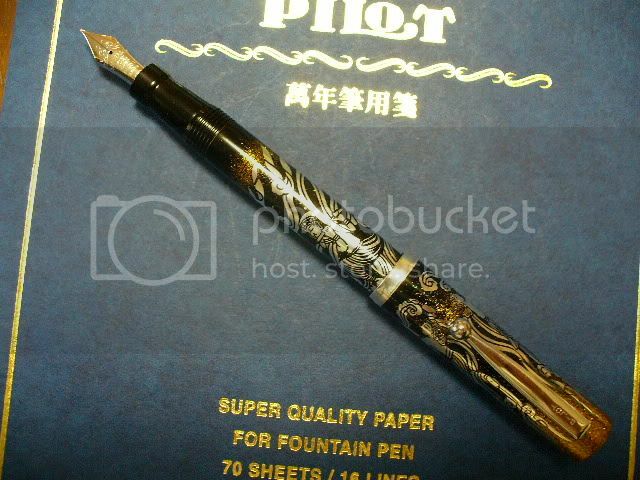 I have always been curious about Pilot's anniversary pens, as most are not available to the USA. The intense work quality on this pen is amazing. I would have to agree it is a bit "showy", and perhaps a little gaudy, but one has to appreciate the artistry that went into it. Congratulations on what appears to be a fine pen! Yeah, I agree with your comment there. I am sure there are many FP collectors who find those Japanese drawings and pictures attractive. But, I just cannot find myself owing one because it is just too loud for my taste. With a MB pen (regardless of its model), you can whip it out and use it in the business setting. 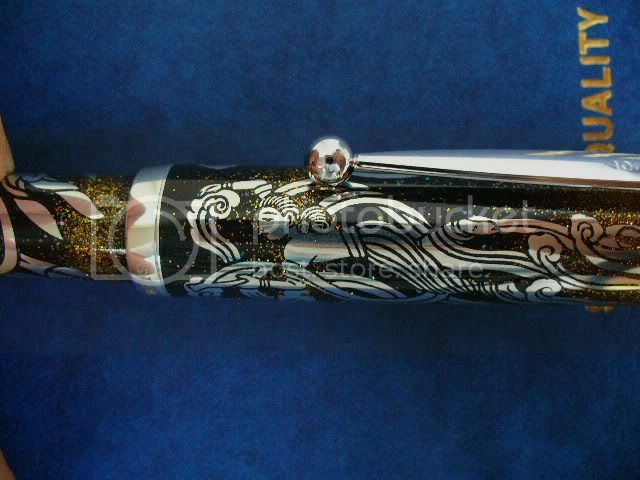 But, with the Namiki with those garish and too Japanese-y drawings, I would hesitate to use in public. Mind you, I have many years of experience in Japan. Edited by Pen2009, 04 July 2009 - 12:16. Edited by georges zaslavsky, 04 July 2009 - 03:18. Edited by rokurinpapa, 07 July 2009 - 17:48. You are most welcome. I did have a look at the blog (good practise for me! ), and I'm glad to have encouraged you. I look forward to all those future reviews. 5 Filling System (9/10) – It comes with a Pilot Con-70 converter that is a Push Button type and holds most ink among Pilot converters (otherCon-20,Con-50). It is very easy to fill it up with ink. By the way Custom 845 or 748 or 90th Anniversary Raden Toki come with Con-70 also. But those converters are made specially with black Urushi(perhaps). However this pen comes with ordinary con-70. Why? Perhaps the substance of the 85th had been a great expense to Pilot. But if Pilot makes an anniversary pen, its converter should be made specially I think. Now I can not edit my post. 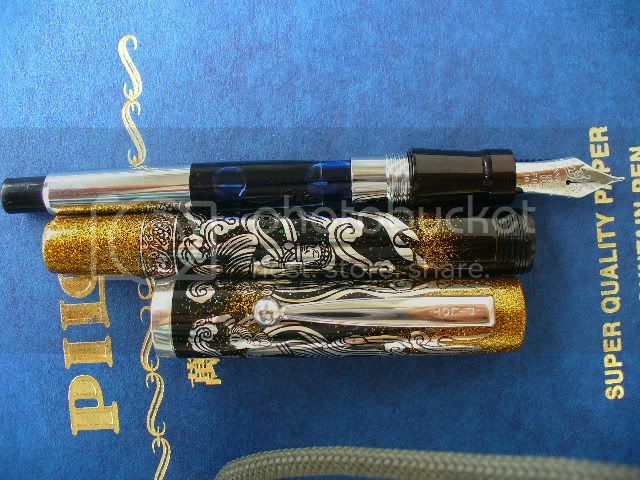 So I would like to correct my post here.I can confirm the fact of con-70 by Pilot staff.As follows: There are black type con-70 for high end pens.They are made of black resin, not urushi.They are not available independently in general, only attached to the high end pens. But in USA they had been sold. Regarding the 85th, not to be lack unity of silver base, ordinary con-70 were attached(I heard that this last words were commented by retired staff planning the 85th.Pilot staff asked by me seeked for him and confirmed the reason.). Thank you for your kind update.You have corrected my review properly as I wish.